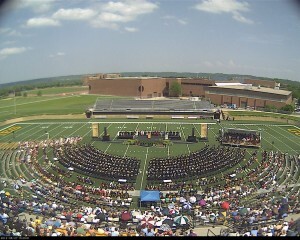 Want to watch the 2012 Gustavus Commencement ceremony but don’t have 3 hours to spare? Here you can watch the entire day compressed down to just over 1 minute. This video was created from a series of images captured by the webcam which lives in the stadium press box and provides a view of the football field to the Gustavus Webcams page.